These, and other hackneyed truisms commonly thrown out regarding the church and political engagement, belie one simple fact of contemporary political engagement: the local church, in America at least, isn’t too political; it’s not political enough. 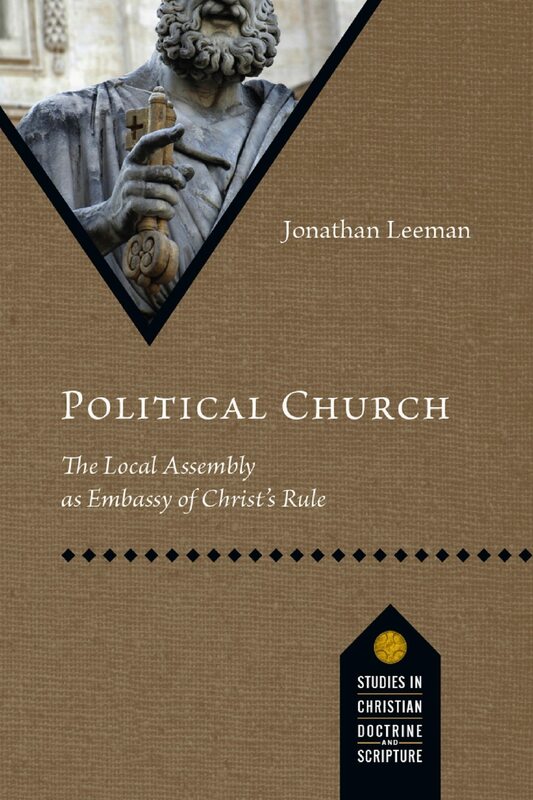 Enter Jonathan Leeman’s Political Church: The Local Assembly as Embassy of Christ’s Rule, a volume primed for a moment such as ours. After all, the hucksterism of the Religious Right coupled with the evangelical dalliance with Donald Trump seem to make the prospect of evangelical politics an exercise in futility, if not an outright embarrassment. I should state up front that this review is intentionally a birds-eye view. Political Church is lengthy yet enjoyable and nuanced yet clear, and deserves further interaction given the scope of his work. IVP Academic. 448 pages. $40. At the outset Leeman reveals the book’s two main purposes: (1) to dethrone the ruling understanding and assumptions of politics that most Christians hold to as the result of 18th-century democratic revolutions, and, in turn, classical liberalism; and (2) to explain how the local church as an institution understands its role as an embassy of Christ’s rule. What he attempts to develop is a coherent framework for what it means for the church to be political. Political Church is structured with lengthy chapters about the nature of politics, the meaning of institutions, and the politics of creation, the fall, the new covenant, and the kingdom. This is a vital work of evangelical political theology—a discipline evangelicals have sadly long neglected. At more than 400 pages, Political Church shows all the signs that a conservative evangelical, who defies typical “conservative evangelical” categories, is doing serious political theology. Indeed, Leeman’s self-professed embrace of anti-modernism makes him a fish out of water by today’s evangelical-political standards. But Leeman’s anti-modern tendencies may be the right antidote to Christian political engagement that too casually imbibes the spirit of liberal democracy. Any serious student of Scripture can hardly find major disagreement with Leeman’s focus on the local church as the center of Christian political identity. And it’s here that his work is most welcome. Leeman’s reliance on Oliver O’Donovan’s call for the church to develop a “fuller political conceptuality” may be the most pressing need for the evangelical church right now. In both its institutional and political capacities, Leeman builds from the ground up an evangelical political theology. This is needed in our day because properly anchoring one’s political identity is the fulcrum for determining proper ethics and the proper mission. In short, Leeman summons Christians back to their primary political vantage point. The portrait of politics as primarily a democratic task is cast aside and in its place is a robust portrait of the church as a living, breathing political institution whose claims are a direct assault on the claims made by today’s nations, kings, and legislatures. One area of strong agreement and helpful clarity is Leeman’s discussion on how, for example, neo-Kuyperians (which I consider myself) often give short shrift to questions of institutional scope. He charges that proponents of this type of Christian political program “tend to stop short of institutional questions such as who has authorized whom to do what, where the lines of jurisdiction and membership fall, and how these structures in turn shape the identities of the actors” (48). I found Leeman’s probing quite helpful here as a necessary pushback against wielding Abraham Kuyper’s “square inch” quote without considering what the precise nature of Christ’s rule is and how it finds expression. Additionally, Leeman does a wonderful job of analyzing a biblical theology of politics, much like one sees with O’Donovan (but far more readable). Readers will be surprised and aided by Leeman’s anti-modernism—that is, by the suspicion he casts on classical liberalism’s placement of religion into one sphere and politics into another. These spheres are much more co-dependent than modernism will allow, which should lead us to question political assumptions and help rebuild a Christian political witness. The only pushback I’d offer, oddly enough, also concerns Leeman’s anti-modernism. While defending an account of religious liberty, his negative portrayal of Enlightenment formulations of religious liberty seems too harsh. With contemporary religious liberty awash in relativistic waters, Leeman sees liberal religious liberty paradigms collapsing underneath the weight of their own design. In contrast, I find the Madisonian vision the best possible option in an imperfect world. Leeman’s account of religious liberty has its merits, but I still prefer the imperfect system in place to the one Leeman proposes. Let me be clear: Leeman argues for religious liberty, but from a decidedly theological angle and less from the grounds that government is designed to be religiously “neutral.” In his view, religious neutrality is impossible. Every moral action springs from some type of religious worldview. Thus, Leeman is less concerned about the government’s competence in religious affairs and more about limiting government’s involvement with religion since it lacks the institutional authority to make accurate religious pronouncements. I both agree and disagree with elements of Leeman’s views on religious liberty. Political Church is a sophisticated, academic project borne out of nine years of labor. The book’s deserves a longer review than what I offer here. Originally a dissertation, it provides a masterful overview of the landscape of modernity’s approach to politics and, particularly, of late modernity’s approach to political theology. A warning and recommendation: Political Church is an intensive, in-depth theological work that non-specialists unfamiliar with academic theology and political philosophy could find challenging. That said, the payoff from investing the time to digest and familiarize yourself with the contents and categories will be deeply rewarding. Anyone interested in the future of evangelical political theology will find Leeman’s work required reading for many years to come. Andrew T. Walker is the senior fellow in Christian ethics at The Ethics and Religious Liberty Commission. He is author of God and the Transgender Debate. You can connect with him on Twitter.